For leaks and spills, Andax has the answer. Use our Original Sorbent Pads to pick up the smallest drip or the largest spill. Sorbent rolls are 15 or 30 inches wide and 150 feet long--in an emergency, you'll want these rolls. Keep the drips and drops, and the grease and grime, in check. Got a spill? Use our Original Sorbent Pads to pick up the smallest drip or the largest spill. Use them outdoors — rain or shine. Use them in your plant or shop under that leaky valve or annoying drip. Keep plenty around in case of a spill. Put our Oil-Selective Pads on water and they'll soak up the oil right in front of your eyes! Use them to wipe down machines or while you're doing scheduled maintenance. They're perfect to catch lubrication oil and grease. Makes your workplace safe, and that's smart! These sorbent rolls are tops! They're 15 or 30 inches wide and 150 feet long. If you need sorbent spill control products in case of an emergency, then you'll want these rolls. Choose from Oil-Selective or Universal... either way one roll will cover more than 375 square feet. Want to stop tracking grease, paints, inks, or grime around your work area? Lay down these rolls and start working cleaner and safer today! Here's another great idea: Lay down a strip of our rolls in front of your dispensing or collecting drums for oils, coolants or solvents. Any drips, splashes, or sprays will get soaked right up! These rolls help keep your floors clean and safe: just cut them to length with scissors or a utility knife. Need a clean place to put machined, cut, or painted parts? Just cut a strip and you're ready to go. Do you want convenience and versatility? This is the answer! Our best selling roll offers great spill response as a roll and the convenience of tearing off just what you need in sheets for maintenance. Do you have secondary containment pallets? Tear off one of these pads and place it in the sump area of your containment pallet. If you should have a leak or a spill, you'll already have it soaked up. That saves time and money. Also, if you have a spill, just roll out this baby and soak it up. You can even tear off sheets and place them where you want them. Choose from Oil-Selective Sorbent Pads/Roll in natural white or Universal Sorbent Pads/Roll in dirt disguising grey. 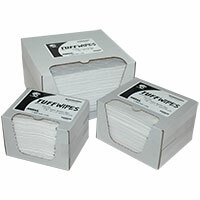 These convenient, disposable Tuff Wipes™ will handle your "TUFF" cleaning jobs without falling apart or wimping out! They're stronger and more reliable than the paper towels, shop towels and rags you're using now. Packaged in a handy dispensing box, Tuff Wipes™ stand up to oils, solvents and chemicals. Tuff textured wipes will pick up what the other wipes won't. Great for wiping down machinery and tools, cleaning parts, spills and leaks. Get the best of both worlds with the 2-n-1 Barrier Spill Matting. This unique product combines an absorbent 8 oz. layer of needle-punch polypropylene with a solid poly backing that prevents spills, leaks and drips from touching your floors and counters. Improve the safety and overall appearance of your facility with Barrier Spill Matting. Clean up your act and walkways too! 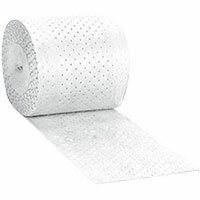 Keep the grease and grime in check with our Industrial Matting Roll. It will also soak up and stop those dangerous slippery spots from water, spilled coffee, oils, grease, coolants, and drips from your fork trucks. And yes, it does handle battery acid if you have electric fork trucks! Just lay a strip down where you park your fork truck at night. Dispensing from drums is messy! But not when you use our Drum Top Covers. Choose from our grime-hiding Universal grey or our Oil-selective white. Each cover is die-cut to fit perfectly around the vent and bung fittings on standard 55-gallon drums. These great sorbent covers will help you keep your work place cleaner and safer.